An Earth-size world orbits its host star in a NASA illustration. The worlds are part of the final census from the Kepler telescope, which found a total of more than 4,000 planet candidates over four years. NASA just added 219 possible planets to its growing catalogue of worlds beyond our solar system, including 10 that are potentially temperate, rocky worlds like Earth. Among its newest clutch is a possible planet that could be the most similar to Earth yet spied: Called KOI 7711.01, the world is just 30 percent larger than our own fragile oasis, and it orbits a star like the sun that’s 1,700 light-years away. Crucially, this roughly Earth-size planet lives in the region around its star where it gets just the right amount of solar warmth for liquid water to potentially soak its surface. Spotted by NASA’s Kepler space telescope, KOI 7711.01 is just one intriguing nugget in the team’s catalogue, which is the final compilation of four years of Kepler observations. Over that time, the telescope shook out 4,034 possible planets from a small patch of sky, 2,335 of which have been confirmed. “Most of the planets found by Kepler are smaller than Neptune, and Kepler really, truly has opened up our eyes to the existence of these small, terrestrial-size worlds,” Thompson says. More importantly, the catalogue contains enough information for scientists to begin practicing exoplanetary demography—or putting together a census of various otherworldly populations rather than focusing on individual curiosities. “We are turning attention away from finding new individual systems toward trying to understand the demographics of these worlds that are most similar to our planet Earth,” Thompson says. Kepler blasted off in 2009 and settled into orbit around the sun. It then spent four years staring at 200,000 stars studding a small patch of sky near the constellations Cygnus and Lyra. Its mission: To figure out how common planets like Earth are in the Milky Way galaxy. To do that, the spacecraft watched for brief blips in brightness caused by planets crossing between their stars and Earth. From the duration and frequency of those blips, scientists could determine how big those marauding planets were and how far from their stars they orbited. Another Earth, to Kepler, is a rocky world living in the habitable zone—a region that’s neither too hot nor too cold for liquid water to wash over its surface. 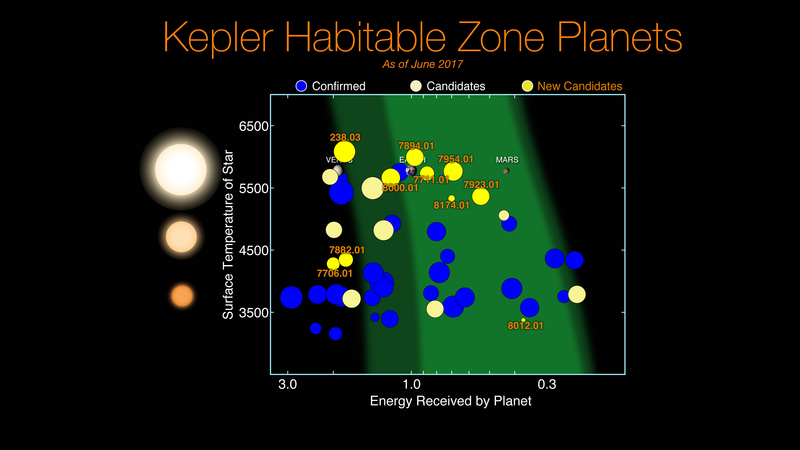 Over the years, Kepler has found several such candidates, allowing astronomers to get closer to an answer. Of the 4,034 possible worlds, nearly 50 are likely rocky and snuggled up near their stars in life-friendly orbits (more than 30 of these have been confirmed as real, so far). “This number could have been very, very small, and I for one am ecstatic that we found 50 potentially habitable worlds orbiting nearby stars,” says Caltech’s Courtney Dressing. That number might not sound exceptionally large, but consider this: Kepler stared at a tiny patch of the cosmos, a field of stars covering 1/400th of the entire sky. The spacecraft could only spot planets whose orbits put them between Earth and their stars—for a planetary system like ours, there’s only a 1 in 200 chance of that orientation occurring, Dressing says. Over the next year or so, scientists will be crunching numbers and extrapolating from that population of 50 rocky worlds to come up with a galactic, Earthy census. Though we don’t have a final answer yet, the likely outcome is that there are billions of Earths in our galaxy. “Are there places we could live in the galaxy besides this place that we call home?” Thompson asks. It’s remarkable that scientists can pose that question against a backdrop of billions of planets. After all, we learned there were worlds outside the solar system a mere 25 years ago. Now, the more we look, the more obvious it is that our galaxy is stuffed with planets that could be very familiar—making it even more likely that we are not alone.